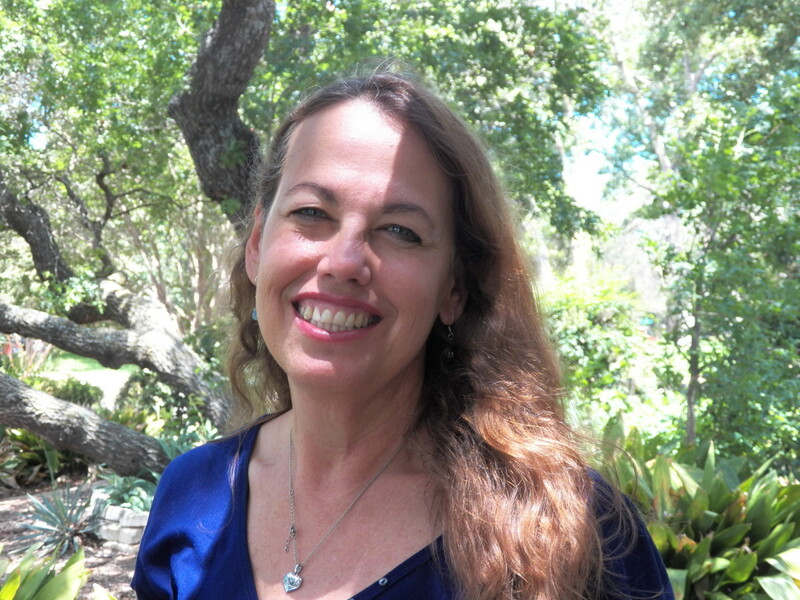 Margaret Minnicks is a health-conscious person who researches the health benefits of foods and drinks. You might have always put your eggs on the inside of the door of your refrigerator. 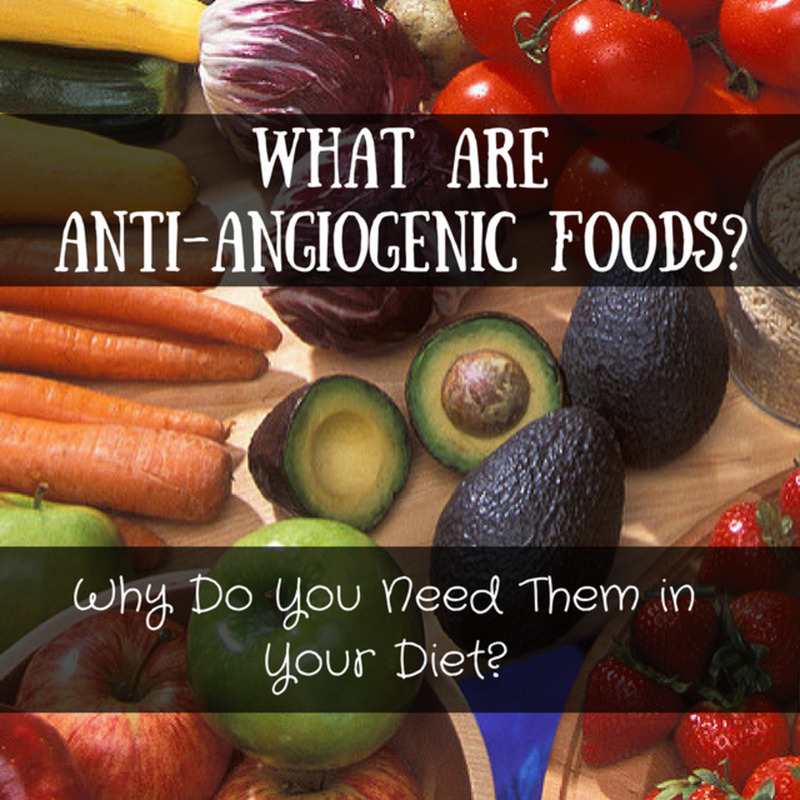 From now on, consider putting them inside the refrigerator on the shelves where there is a constant temperature. Keeping your eggs and milk on the refrigerator door isn’t the best place to store those two products. Eggs and milk catch air every time the door is opened. Since eggs and milk should not be kept on the door, consumers want to know why manufacturers put a rack there instead of putting a compartment for them inside the refrigerator. Apparently, makers of refrigerators did not do much research before they made the decision to design the kitchen appliance that way. Many consumers think using the compartment on the door is acceptable; otherwise, it wouldn't be there. So, why shouldn't you store your eggs and milk there? The doors are the warmest area of the appliance and should be reserved for foods that are less likely to spoil or lose their freshness. It is a very good reason the door shouldn't be the place to store your eggs and milk. Most families usually open and close the door on the refrigerator many times during the day. This exposes your dairy products to temperature changes. 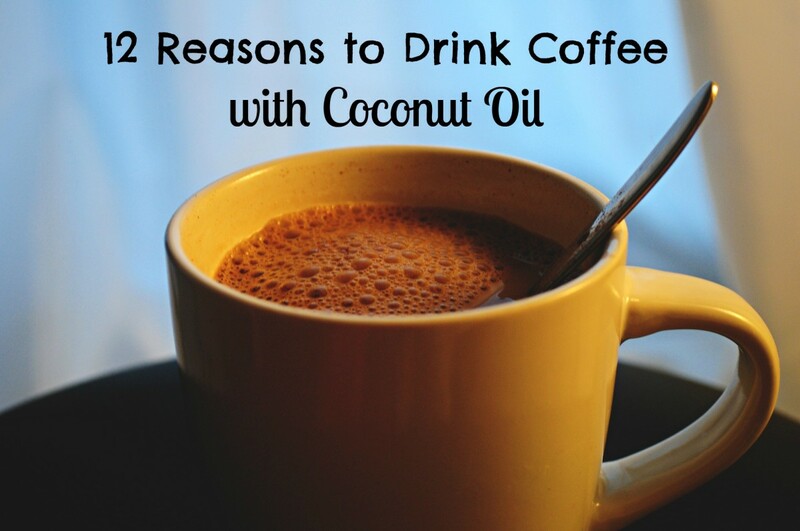 According to food experts, this constant change leads to bacteria. The best way to store eggs is to leave them in their original carton and store the carton at the back of the refrigerator. They will stay fresh much longer because the eggs will maintain the same temperature. That same temperature keeps the eggs from drying out before you use them. Also, the constant temperature at the back of the refrigerator keeps bacteria away. This means the risk of getting salmonella is greatly reduced. A good reason to keep eggs in their original carton is to know when the expiration date is. If you purchase eggs and add them to the ones you already have, you will not know which ones are fresher unless they are still in their cartons. The refrigerator door is the last place eggs and milk should be stored. Eggs will stay fresh for about 3 to 5 weeks when they are kept in their original container. The quality is greatly reduced when they are taken out of the carton and put in the section designated for eggs on the door of your refrigerator. 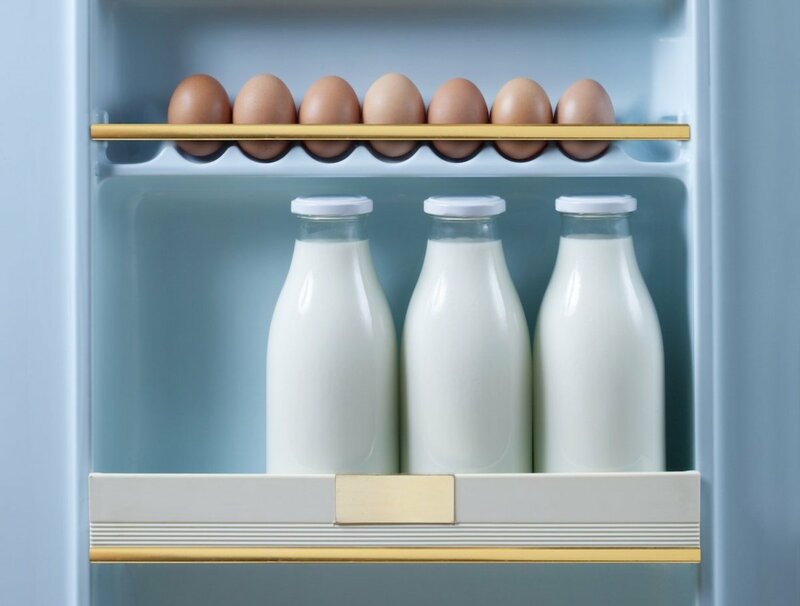 The reason for storing milk inside of the refrigerator instead of on the door is the same reason eggs should be stored inside the refrigerator. Milk, like eggs, should be stored on refrigerator shelves where it is cooler, rather than in compartments on the refrigerator door. After you open a carton of milk, it is safe to consume up to three days later. Therefore, it is always better to purchase smaller containers of milk instead of keeping larger containers open in the refrigerator even if they are stored in the back of the refrigerator. If you buy a new carton of milk while you still have an older unopened carton, remember to always open the older carton first. The first one you put in the refrigerator should be the first one you use. Always keep milk containers closed and placed away from foods with a strong odor because your milk might smell and taste like those foods. Families that don't use milk that often could purchase powdered milk that will keep up to six months, if unopened. After the milk is opened, it will last up to one month if stored properly in the refrigerator. Leftover evaporated milk doesn't need to be tossed. You can freeze it for up to six weeks, and it will not lose its flavor or nutritional value. What's Wrong In the Picture? What Foods Can Be Stored on the Refrigerator Door? Just because there are compartments for eggs and milk on your refrigerator door, it doesn't mean you have to use those products there. If you feel that you must use that compartment for something, there are some things that can be stored there without any problem at all. If you want to use that space for something, store your condiments there. In fact, mayonnaise, ketchup, mustard, bottled water, sodas, and juices don't lose their favor because of the changing temperature when the door is opened and closed. 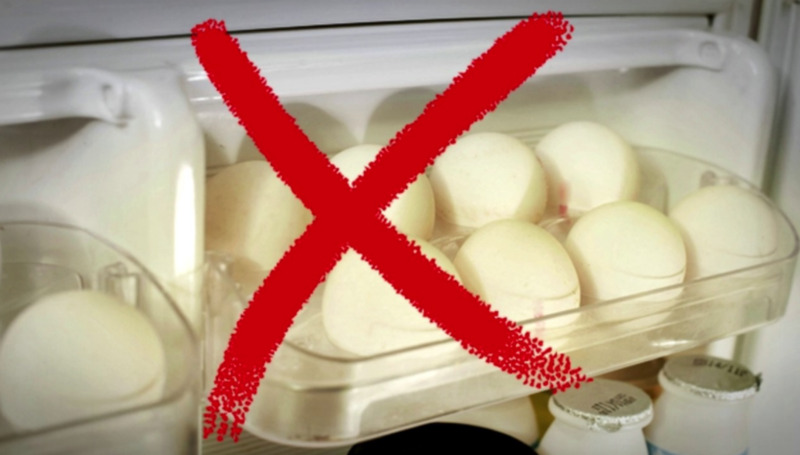 Do you store your eggs in a compartment on the refrigerator door? 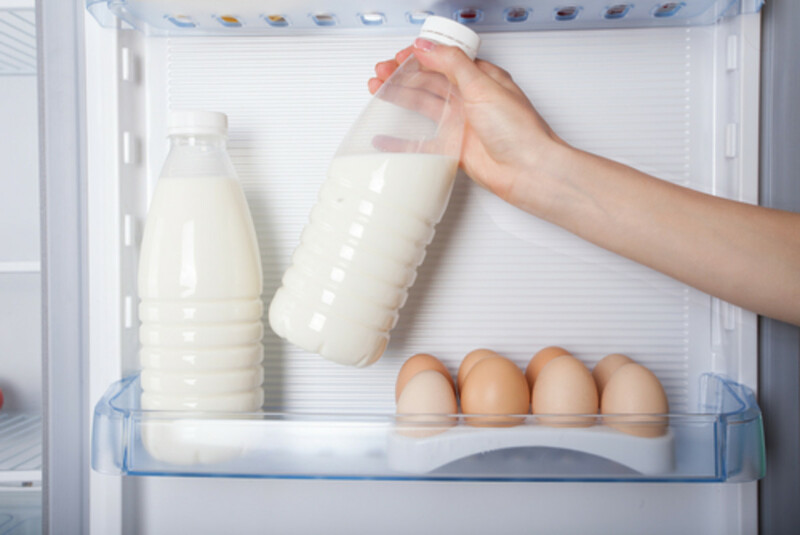 Do you store your milk in a compartment on the refrigerator door?